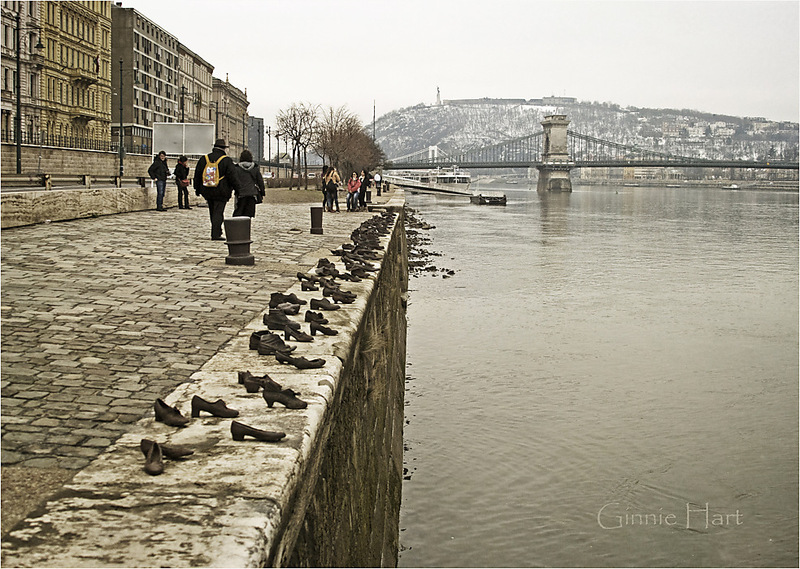 to the Hungarian Jews shot into the Danube during the time of the Arrow Cross terror in 1944-45. Sixty pairs of cast-iron shoes, in the styles of the 40's, stand in remembrance. Ginnie Hart: It definitely smacked me right between the eyes, Ray! Fabulous capture Ginnie! This is a wonderful memorial to those who lost their lives during the war. Ginnie Hart: Thank you, Frances. It's a somber place to visit! These shoes are the silent witness what happened. I think, nobody can walk by without thinking about the ugliness of it all. A wonderful memorial. I love the bridges in the background. Ginnie Hart: That first bridge (Cross Bridge) was where our ship was docked for two days, MLMA. I'll never forget this memorial my whole life! Ginnie Hart: Lest we forget, indeed, Emma. Merci. Ginnie Hart: Sombre is the perfect word, Lisl! Ginnie Hart: Thank you for your comment, Marie. I took many pictures of this memorial and chose this one to give the POV at the edge of the Danube where they were shot. So sad. Oh wow! I was not aware of this memorial. In one way very cool; and in another very sad and haunting. Ginnie Hart: Haunting is a good word, Brian. Few things have moved me more! Ginnie Hart: You're absolutely right, Bill. Ginnie Hart: It still haunts me, Marcie. You cannot be untouched after seeing such things! A sobering reminder and memorial Ginnie. Looking further afield, that could almost be snow on the hills. Ginnie Hart: Sobering, indded, Chad. And look at you, observing correctly that there was snow in Budapest that day! Ginnie Hart: No swim that day, Alan, as it was freezing cold. Oh that it HAD been such, however! Quite a moving image Ginnie! Very nicely captured. Ginnie Hart: Moving and quite horrific for me, Richard. Thanks. This would unsettle me too. Jessikah and I went to the holocaust museum in Washington. I don't think she realised the extent of the horror before then. Very sobering, these memorials must remain to remind people. Ginnie Hart: I totally agree, Auusie. And to think there are still some who say it never happened! Ginnie Hart: Another good word, Sister. I will never forget its affect on me. It certainly is a fitting memorial to such a horrendous occurrence. Ginnie Hart: I agree, Mary! Ginnie Hart: Yes, Juan Carlos! A poignant and heartbreaking reminder of man's inhumanity toward his fellow beings, Ginnie. I only wish that these memorials, dedicated to the innocent victims of the most evil & depraved among us, could put a stop to the madness. Sadly, this is not the case. Ginnie Hart: It's enough to keep breaking our hearts, Beverly, over and over again! The Hungarian history of being occupied by consecutive invaders, from the turks to the soviets is full of incidents of wonder and shock. A proud people that never lost there hope and will to survive. A vivid memory of one of the best remembrance 'statues' I have ever seen. Ginnie Hart: Yes, Louis. Yes! Like a few others I was not aware of either this memorial or the awful events it remembers. Ginnie Hart: It was new for me, too, Brian. It still shocks me! Ginnie Hart: It's one of those memorials hard to like, Rani, but I'm very glad it'sa therte, "lest we forget." Ginnie Hart: Yes, Anne. Yes. This just punches me in the gut! Ginnie Hart: I know, Robin. It still does the same to me! Ginnie Hart: Very sad, Helys. It still breaks my heart! Ginnie Hart: I guess you think they all went swimming? How I wish! They were shot into the river because they were Jews....! Oh I remember this place! But I don't remember the story behind these shoes! I visited the Jewish Museum in London a few weeks ago. There were so many American tourists there. Ginnie Hart: There's a ground plaque nearby, LC, but you get lots of info when you Google it. So sad....! Interesting - I'd never heard of this memorial - I don't think I've been along that particular bit of the river on my visits. Ginnie Hart: It's not that old, Tom--from 2005--but it's definitely worth trying to find. It's near the Cross Bridge on the Pest side. Ginnie Hart: Yes, indeed, Larry! A poignant reminder of the atrocity, your photo does it justice. Ginnie Hart: Sad but true, Cherry. Thank you. Very touching shot. I like the leading lines and how drawn into this photo it makes me feel. I would like to see this one day. The sepia is a good choice, too. Ginnie Hart: It's even more powerful up close and personal, Bonnie. It'll haunt you forever. That is such a moving memorial. It has huge impact. Ginnie Hart: Thank you, Dave. It'll haunt you forever in real life. Ginnie Hart: I couldn't have said it better, Janet! Thank you. That certainly would be disturbing. Ginnie Hart: Yes, indeed, Michael. Amazing image, Ginnie. Thank you for sharing this. I find these so disturbing. Like I can't face man's inhumanity to man. Ginnie Hart: Exactly, Elizabeth. I'm glad we have these memorials, "lest we forget." Sadly, many HAVE forgotten! Ginnie Hart: I have much better up-close-and-personal images of this memorial, George, but I wanted to show the "forest" to get the overall effect. Thanks. Ginnie Hart: Never to be forgotten, Wim! Thanks. Ginnie Hart: Thanks, Oscar. The thing is, sadly we never seem to learn from our mistakes! yes disturbing is the correct term. and i think the castings were a great way to remember those shot. Ginnie Hart: I will never forget it, Ayush! Thanks. i didn't know about this.. even while viewing it from a computer screen, it is striking.. nicely captured. Ginnie Hart: It strikes you to the core when you see it in real life, Rian! Trust me. Thanks.